While the 845DC EVO is aimed at read-centric applications, the SSD845DC PRO is aimed at write-centric ones such as app and database servers and uses the 24-layer version of the company’s new 40nm 2-bit 3D – Vertical NAND stacked cell technology, another Samsung world first. The one thing that the new design of NAND gives the 845DC PRO is endurance, helped in no small part by its larger geometry. Samsung claims the drive can perform 10 Drive writes Per Day (DWPD) which works out at a colossal 4TB per day or 7,300TB TBW (Total Bytes Written) for the 400GB model over the length of its five year warranty period. To give you an idea of how much of an improvement that is over the 845DC EVO, the 480GB EVO has a TBW of just 300. As it stands the 845DC Pro comes in only two flavours; 400GB and 800GB with the 400GB unit having 512MB of DDR2 cache which is doubled for the 800GB drive. 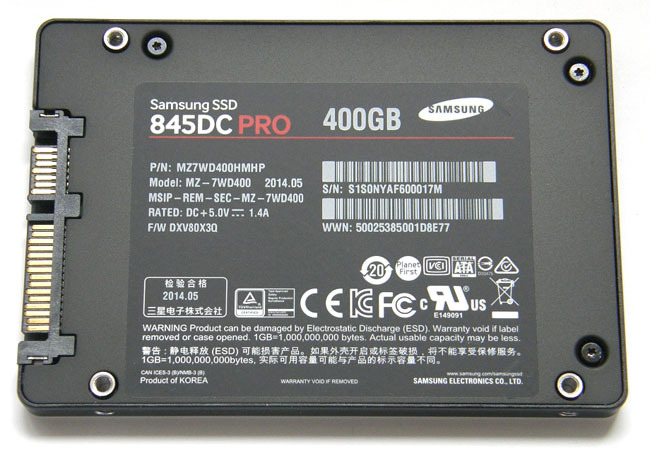 To reach its 400GB capacity the drive uses four 128GB Samsung K9PKGY8S7M-CCK0 3D V-NAND chips which gives a total of 512GB, so that means there is 27 per cent over-provisioning provided, much more than its consumer cousins. Looking after this drive is, somewhat surprisingly, an older controller in the shape of Samsung’s 300MHz MDX S4LN021X01-8030 chip. It’s the controller that was launched with the SSD840 PRO but with completely re-written firmware to take account of its data centre requirements and control of the new NAND technology. 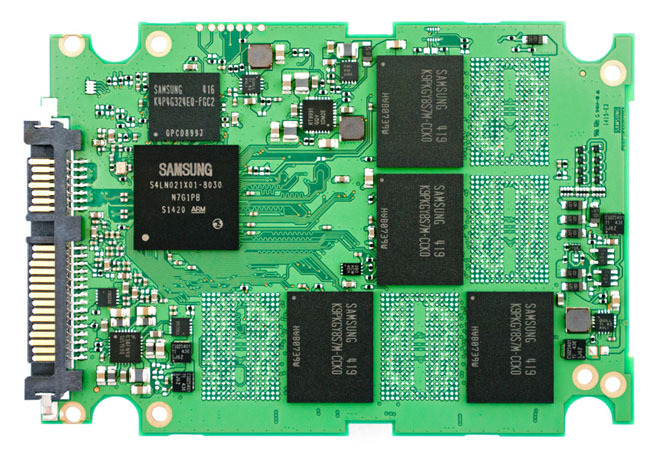 An interesting point with the design of the PCB is that Samsung is only using one side of it to hold the controller, NAND and cache. 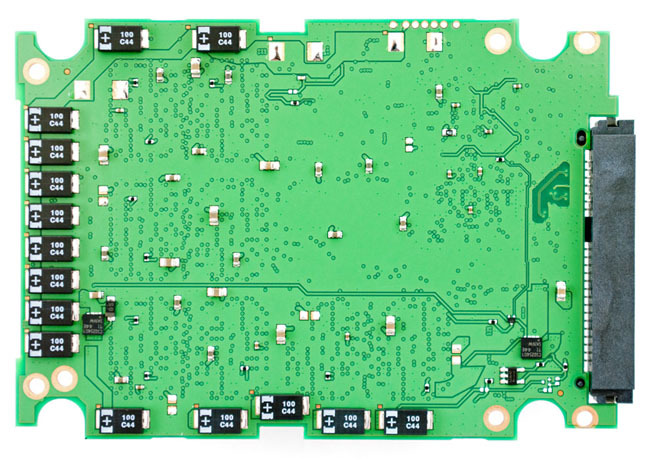 The other side of the board is home to the tantalum capacitors which, just like 845DC EVO, allows the drive to write all the data in the cache to the NAND in case of a power outage. Quoted sequential read performance for the 845DC PRO is the same as the 845DC EVO i.e. up to 530MB/s but the new NAND gives the PRO significantly better write performance at up to 460MB/s for both capacities of the drive. When tested with the ATTO benchmark, the 480GB 845DC EVO produced sequential read/write figures that were both higher than the officially quoted figures – 556MB/s for reads and 438MB/s for writes. It’s the same story for the 400GB 845DC Pro, the ATTO benchmark giving up a read score of 563MB/s and 485MB/s for writes, both figures comfortably faster than the official figures. The 3D V-NAND in the 845DC PRO gives it better sequential read and more significantly a superior write speed performance compared to the EVO. I also did some real life testing – copying a 50GB folder (containing 28,523 files), a 4GB image and a 17GB Blu-Ray image. Using the Teracopy app I was able to get a MB/s figure as well as a time taken for the copying to complete. As Samsung gave me two drives of each type to play with, it seemed impolite not to set them in a couple of RAID arrays so I set them into RAID 0 and RAID 1 setups to see how they perform. As you might expect in RAID 0, both paired drives have significantly faster sequential read/write speeds. In the ATTO benchmark the RAID 0 EVO’s gave read/write scores of 1094MB/s and 832MB/s while the PRO is even faster, producing 1113MB/s for reads and 947MB/s for writes. For the 50GB folder copy, the PRO and EVO single drive figures were 9min 05s and 9min 09s respectively. The only marked difference was 2min 06s (PRO) and 2min 25s (EVO) for the 17GB Blu-ray copy. The 4GB image copy was identical at 32s. As for the RAID results, the 845DC PRO had the edge on the EVO, being around 10 to 15 per cent faster.